Aaron grew up in San Diego, CA. His journey with music began when he started taking piano lessons with his grandmother at age 8. After a few years, he decided to stop the lessons, but the seeds of music had been planted and later they would grow into a deep love of the piano and music in general. One day when he was 17 he went to the store with his mother. While looking through the music section, he noticed an album that said “Solo Piano”. Intrigued, he grabbed the CD to take a closer look. The album was George Winston’s “Forest”. He had never heard piano music like this. Aaron then purchased other solo piano albums from Winston and another artist that would become a favorite: Jim Brickman. It was these recordings that inspired him to start playing the piano again. 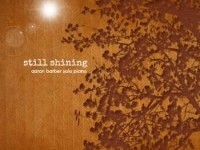 Shortly after “rediscovering” the piano, Aaron began to compose his own solo piano music.